Precast concrete was used for all internal core walls, therefore climbing arrangements needed to accommodate the installation of these as well as providing access for workers and equipment. Bespoke ACS-R platforms provided a generous hatch opening to accommodate precast stairs. Hydraulic striking accelerated the pace of construction. ACS-G arrangement enabled the inside of the core to be completely free of platforms. ACS-G anchors were installed on the outer walls of the core, allowing both sides of formwork to be suspended via a gallows trolley. The climbing arrangement was ideal, as the inside of the core had to be completely free of platforms, with the exception of two corner platforms. This provided a large open space for the customer so they could position the precast internal walls. Hydraulic striking pieces were installed to facilitate the stripping of inner formwork. This saved time over the course of the project and reduced number of workers required to operate the system to one. 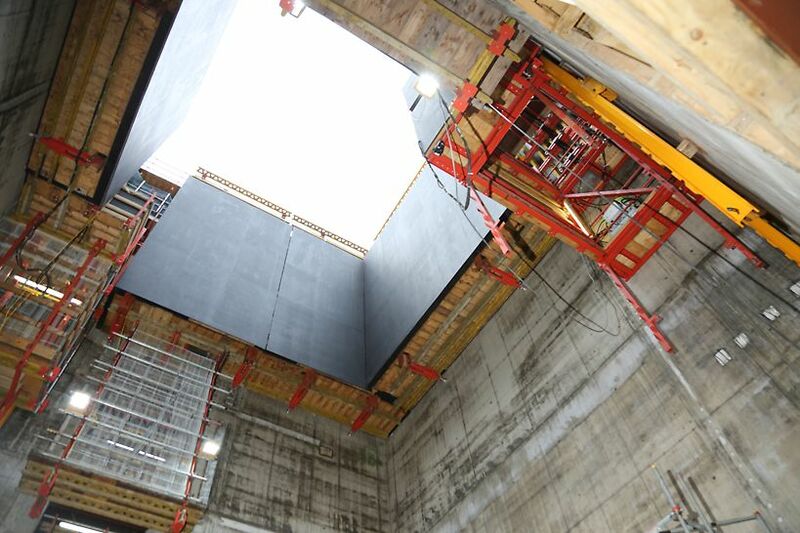 Eight hydraulic striking pieces enabled almost 230m² of formwork to retract by 5cm at the push of a button. Once struck, the panels were immediately repositioned in a single lift without crane assistance. 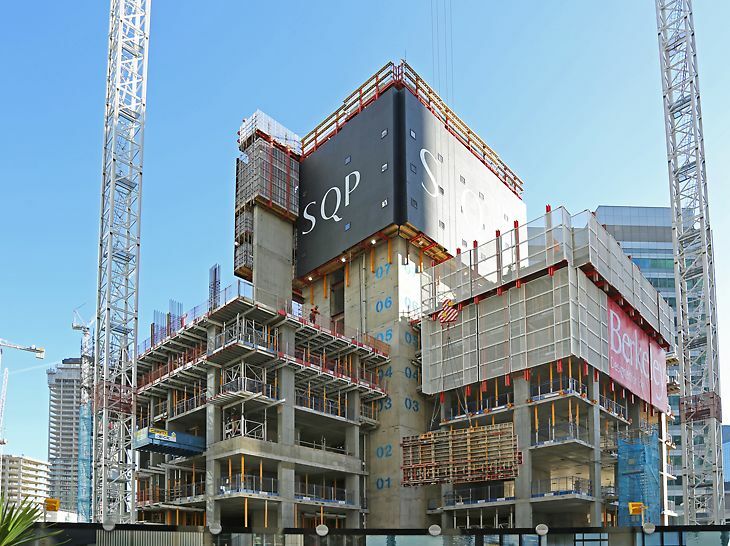 Fully secure working platforms on the exterior allowed workers to retract outer formwork manually via integrated SLS spindles. All outer platforms then jumped to the next casting section in one lift. 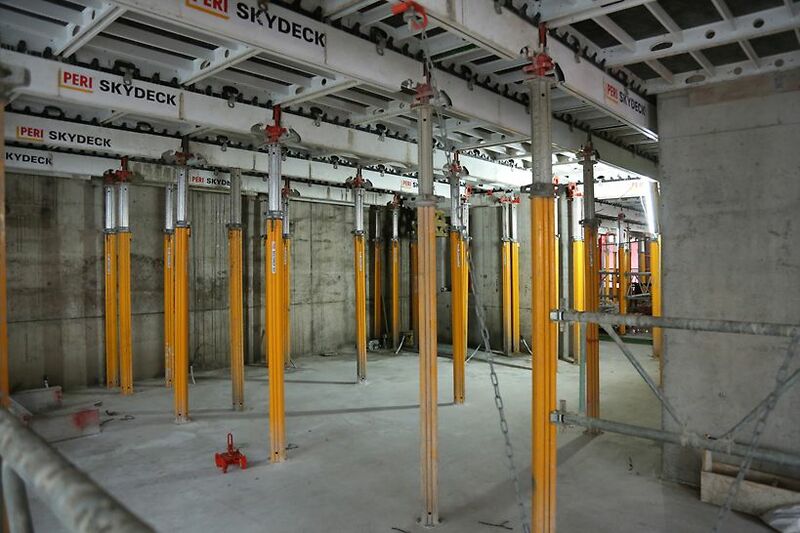 To support the pace of construction, the height of formwork was designed to pour one and half floor heights each time, reducing the total number of jumps required. We fabricated two bespoke ACS-R platforms featuring a 3 m x 1.5 m hatch opening. Custom-built platforms accommodated precast stairs, enabling workers to install them as the building progressed.